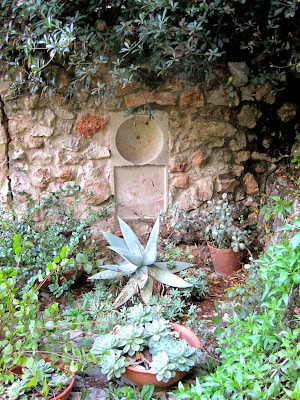 Mediterranean gardens can be wonderful. Plants grow so well here especially with our sun and more sun and winter rain. Why then have plants in pots when they do so well in the soil? I suppose for me it’s personal. My garden is a series of levels with viewing gardens and nothing suits viewing gardens more under a merciless sun and a cold wet rainy sky than the constant beauty of carefully selected and arranged pots. Whatever the weather there is something soothing and satisfying about the lyrical and architectural shape of plants in their pots. What kind of plants? 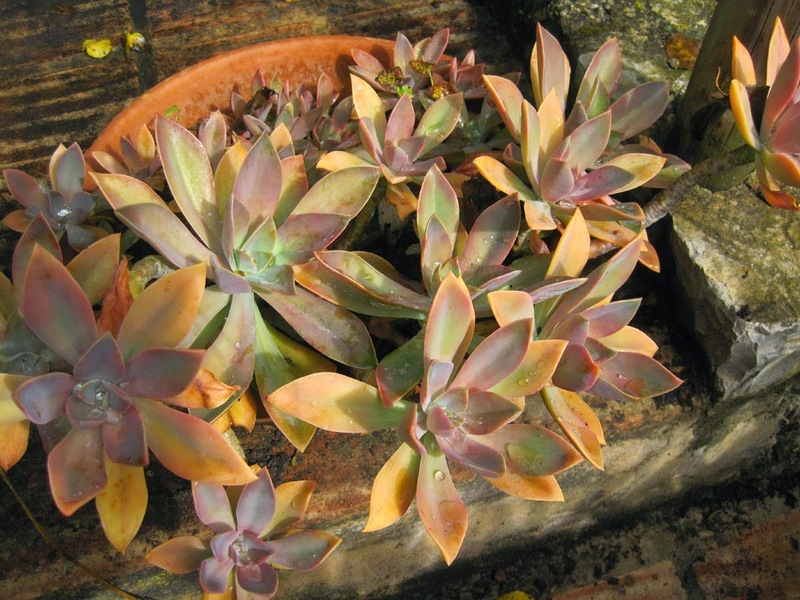 Succulents are a favourite of mine and although many have flowers, it’s the leaves that give me the most satisfaction, They come in so many shapes, plump and narrow, elegant and long, in shades of grey and green and bronze and deep orange and red while the leaves of echeverias , not only have colour, they glow. What kind of pots? 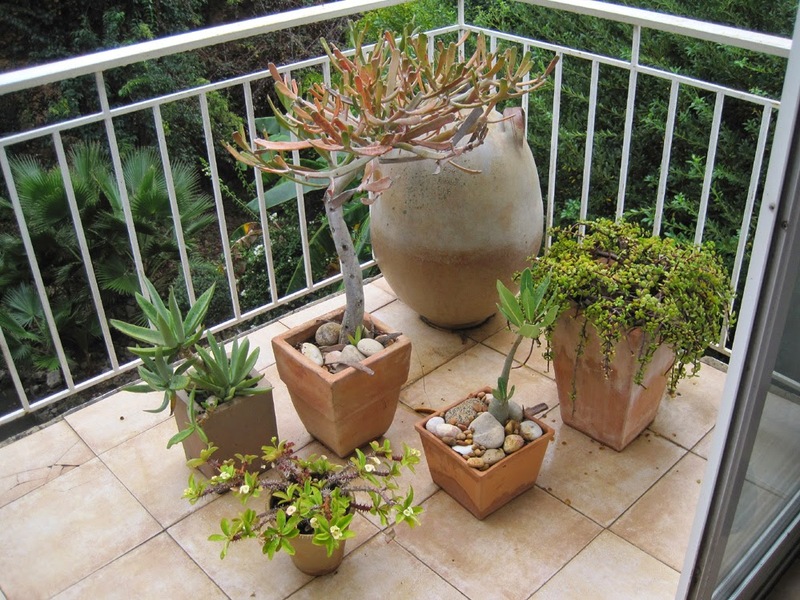 I choose pots that complement and enhance the look of the plant. 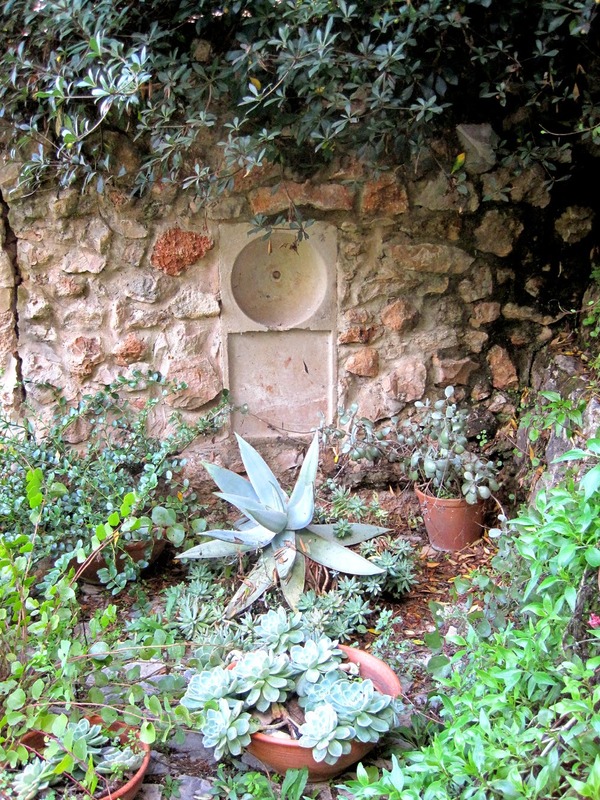 I look for square or round pots, clay or earthenware, glazed or unglazed. Even the cone shaped conventional clay pot will complement some plants. Where in the garden? I have are several spots. 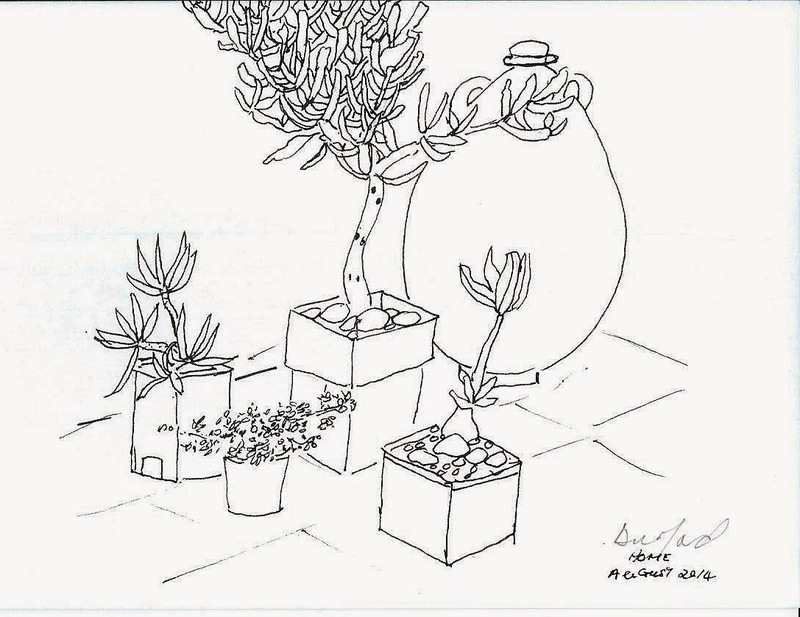 When I have breakfast I look out on several plants in pots in two groups on a small terrace. The cluster of pots on the right hand side stand in front of a gloriously large and plump stoneware pot. At the back of this group is a succulent with branches like the antlers of a deer (Euphorbia xylophylloides) next to her is the sharply pointed green leaves of a Cotyledon orbiculata (collected from a pavement in Johannesburg) while in front of them there is a small thorny plant (Euphorbia milii from Madagascar) with its yellow flowers and pastel pink and yellow leaves and an Adenium (from Saudi Arabia) and her exquisite pink flowers . Standing quietly to one side of the group is the weeping form of Portulacaria afra, her glossy, waxy eaves cascading down the sides of the pot. Month in and month out they are there to delight me as the leaves change colour with the seasons or sometimes with their flowers. 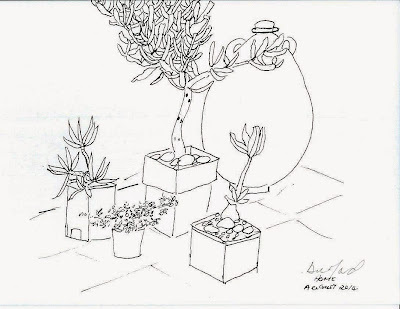 The exception is the Adenium who moves indoors in winter. She can take the cold but not the combination of cold and wet. On the left of this terrace is a Euonymus fortunei in a big blue and white dragon-decorated Chinese glazed pot and in front of her is a bonzaied Portulacaria afra and a small bowl of Zephyranthes candida with its thin, spring-onion leaves and its white crocus-like flowers in autumn. Also in the cluster is a small symmetrical earthenware pot and a rock which has been split in two to reveal the fossil of an shell. Five subjects because I believe in odd numbers for a viewing garden. A raised area in the garden provides another viewing garden ; this time for a very large Bilbergia which occasionally sends out long showy spikes of red and purple flowers but it is the variegated grey leaves that are its main feature and the back drop for an occasional echevaria or in early summer my favourite day lily ‘Corky’ who provides a splash of exuberant yellow in the dappled shade of the carob. And it’s under the carob that I also have my Cliveas (Clivea miniata) with their neat dark emerald leaves in large green pots where they stand in solemn and immaculate beauty for most of the year until there is an explosion of colour in February /March when huge clusters of orange blooms set that part of the garden alight. And throughout the garden, on another terrace and on a low wall, a path, bowls of simple Echevarias light up the way with their glowing leaves. All part of the potted version of my Mediterranean garden.